Restored Balance Arthritis Pain Relief Formula is a revolutionary new cream that combines the natural, yet powerful, pain relief of Pregnenolone, Ginger Extract and Emu Oil with the Cartilage and joint building benefits of Glucosamine Sulfate, and MSM. And unlike other topical pain creams that have distinctive, often unpleasant smells, the deep penetrating formula of Restored Balance Arthritis Pain Relief Formula is odorless with no color additives. Unlike aspirin and nonsteroidal anti-inflammatory drugs (NSAIDs) that simply mask the pain of arthritis, the natural ingredients in Restored Balance Arthritis Pain Relief Formula provide safe, immediate relief of pain with NO SIDE EFFECTS. This remarkable formulation goes to work where the problem starts and offers long term benefits. Inside the joints, Glucosamine Sulfate actually nourishes the parts of the joint to aid in the healing process, increases mobility and regenerates damaged cartilage as it helps relieve pain, while the other ingredients, Pregnenolone, MSM, Ginger Extract, and Emu Oil, ease the pain and inflammation. Prescription drugs used in the treatment of arthritis can produce dramatic side effects. Typically used in medications for osteoarthritis, such as aspirin, ibuprofen and diclofenac, are effective at alleviating acute pain, but do nothing to stimulate the body's healing pathways. In fact, they may actually interfere with the body's repair process. They can pose chronic health complications such as gastrointestinal bleeding, ulcers and kidney and liver toxicity if used for extended periods of time. Also, methotrexate, which is typically used for rheumatoid arthritis, is even more toxic and has been linked with increased cancer risk. When you try Restored Balance Arthritis Formula, you will begin to get relief from arthritis pain from the first application. To avoid further pain, the recommended application is three times daily to specific painful areas. To achieve maximum benefits, you should use one (3 oz.) 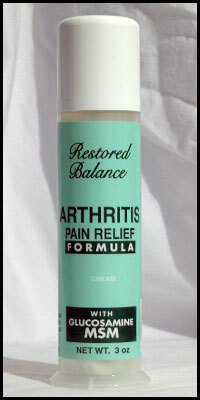 pump of Restored Balance Arthritis Formula each month, with applications three times a day for the first four months.